Description: This magnificent scultpure, he comprises an equal mixture of Vishnu (Hari) on the proper left and Shiva (Hara) on the right. The Vishnu side wears a Kirita (tall miter)from which curly locks escape to lie on temples and tumble down the back. The garb is an understated Sampot (Sambat) with graceful folds slanting across the thigh suggested by incised lines and ripples at the lower edge carved in slight relief. 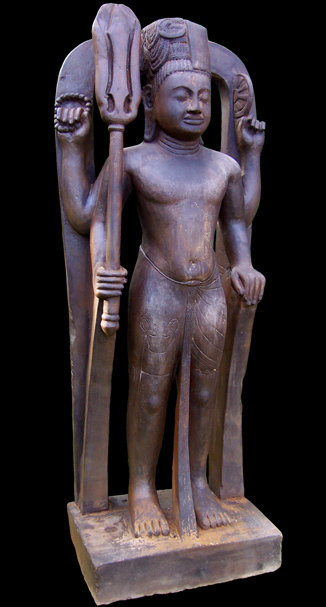 The Harihara cult presumably offered its adherents the protection and spiritual inspiration of both Vishnuism and Shivaism, and its poularity testifies to the syncretic tendencies within Khmer civilization.